AG-HPX610PJH/EJH - Nelco Media, Inc.
Low-rate proxy files (Quick Time/H.264) with high resolution and superb sound quality are supported. This allows a PC, a Mac, a tablet, or a smartphone to be used for previewing, metadata input, network transfers and even simple editing, for a cloud-based workflow that maximizes IT potential. With this option, the AG-HPX610TH/610TF records proxy files onto SD/SDHC memory cards or onto P2 cards. It supports high-quality video (Quick Time/H.264) and audio formats at a low bit rate. High-quality proxy files can be used for breaking news and other scenarios that would benefit from proxy workflows. Moreover, it streamlines the production workflow by allowing the editor to review the content details during offline editing. These options enable use of a wireless or wired (Ethernet) LAN. Proxy files can be streamed or viewed via a standard web browser on a PC/ Mac, tablet, or smartphone. While viewing the streamed files, metadata can be added to the P2 files. Using a PC/Mac also enables a cloud-based workflow by uploading and sharing video data via a network. The AG-HPX610PJH/EJH/PJF/EJF and a device, such as a PC, a Mac, or a tablet, connected to a wired or wireless network can be used for playlist editing. 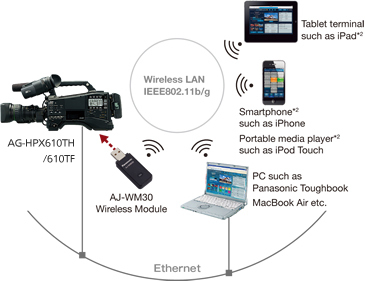 This greatly increases the efficiency and speed of your workflow by making it possible to handle preliminary editing with only the camera and connected device, and then transfer the data wherever it is needed. 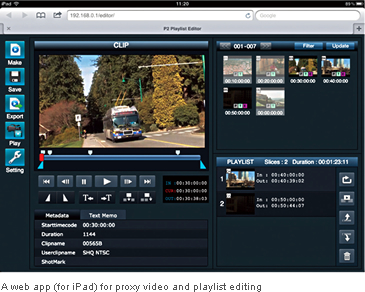 Playlist editing and saving, playlist viewing and SDI output, as well as editing and copying, can all be done by web apps. Support is provided for video uplink systems using ordinary phone lines. The status, settings and bandwidth condition for the LiveU LU40 Series can be displayed on the camera viewfinder, and uplink start/stop can be operated by camera-operator without taking the eye away from VF. This allows the camera operator to handle live relays comfortably and securely. In 720p mode, the frame rate can be set in the range of 1 fps - 60 fps, and in 1080p mode, it can be set to 1 fps - 30 fps. 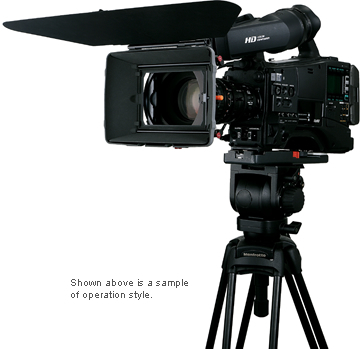 This allows the use of undercranking and overcranking to create fast-motion and slow-motion effects. Either 24p/30p Native mode or over 60p mode can be selected for recording. 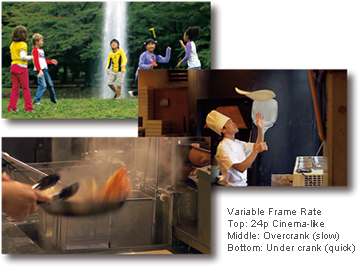 In addition, the 24PsF format can be output from SDI OUT for uncompressed data recording. 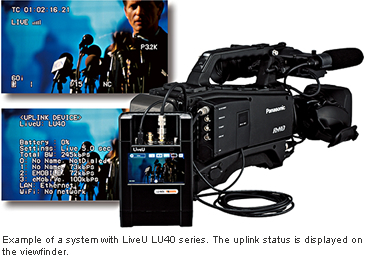 The status, settings, and bandwidth condition for the LiveU LU40 Series can be displayed on the camera viewfinder, and uplink start/stop can be operated. This allows the camera operator to handle live relays comfortably and securely.